Ninjatrader is a professional trading and charting platform which is quite popular among investors and traders. 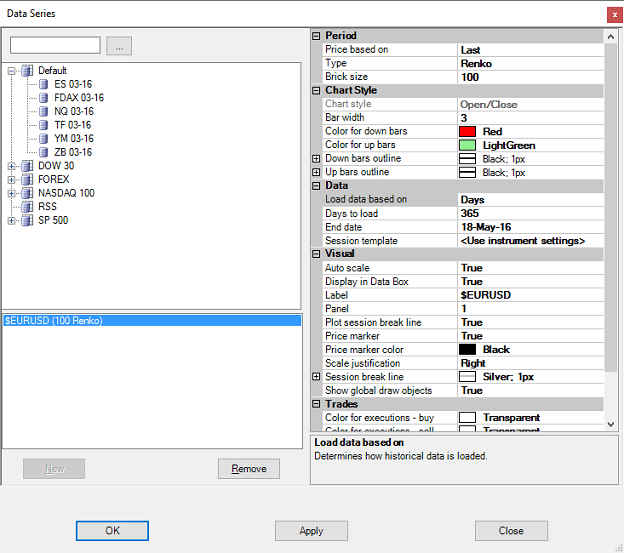 Ninjatrader is a standalone platform that allows traders to connect to select brokerages, FXCM being one among them. The current version, Ninjatrader version 7.0 has seen big improvements from its predecessors and comes with features such as a vast library of standard trading indicators, drawing tools and many more. 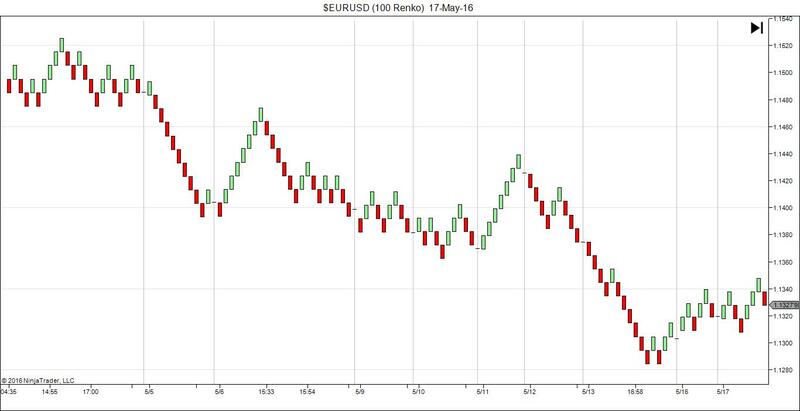 In the context of this article, it is interesting to know that Ninjatrader also allows for trading with Renko charts. The Ninjatrader Renko charts are available as an inbuilt option, meaning that there is no requirement to use additional plugins or customized indicators to build up the Renko charts on Ninjatrader. In this article, we take a detailed look at how we can customize and use the Ninjatrader’s native Renko chart application. For illustration purposes, a demo trading account was created with FXCM to enable live data to stream through. In order to configure the Renko charts on Ninjatrader, the first step is to open the chart and double-click on the price bars, which opens the ‘Data Series’ window. Here we can then put in our customizations. Under ‘Type’ from the dropdown, select ‘Renko’ and then put in your brick size. Note that a value of 100 means a 10 pip Renko brick size. You can also further customize the charts by using color customizations. The ‘Data’ sub-section shows you how much of history to be used for building the Renko charts. In this example we used 365 days. Once you input all the details, click on Apply and ‘Ok.’ If you are loading the Renko bars for the instrument for the very first time, then it takes a few minutes for the Renko chart to be populated. You can now trade directly off these Renko charts by enabling the ‘Chart Trader’ functionality. Using either indicators or the drawing tools, it is also quite easy to run your own analysis on Renko charts from Ninjatrader. 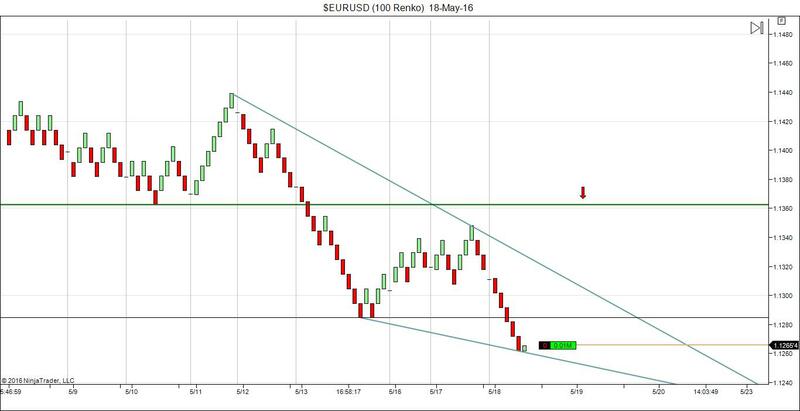 Ninjatrader Renko Charts – What’s missing? While Ninjatrader definitely scores points for offering native Renko charts, a few customizations are definitely missing. Firstly, the fact that the Renko charts cannot be customized beyond what is shown is a major drawback. Having the option to show/hide the wicks would have been a great improvement. While some might disagree, the wicks in the Renko chart can be of great help if you are back-testing your trading strategies based on Renko charts. Also missing from the equation is the custom Renko charts such as Median Renko charts. Other options such as plotting Renko charts based on ATR values is another feature that is missed, but according to me isn’t that critical a feature. The obvious question that comes to mind is whether Ninjatrader is better than FXCM’s Marketscope. On comparison I find there to be no difference between Marketscope or the Ninjatrader when it comes to charting capabilities with Renko bricks. It eventually comes down to how comfortable a trader is. Overall, I find that the Ninjatrader’s Renko chart is quite decent although basic. For the most part, traders should not have any problems using the native Renko chart option offered from Ninjatrader. The platform itself is quite robust and allows you to connect to or trade with different brokerages.